Ravelry: Companion pattern by Glenna C.
This pattern and the others in the Socks For Big Damn Heroes collection are currently on hiatus and awaiting a pattern reformat. I hope to have them back up soon! Even classy and stylish geishas of the future, like Inara Serra, need a little comfort luxury just for themselves now and then. Still, a few elegant cables and rich colours might not be enough – sometimes you might need a little shimmer and sparkle, which these socks add to your wardrobe through the application of a few beads. These are worked from the cuff down, on DPNs or Magic Loop method. 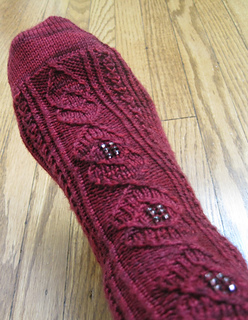 One of three Firefly-inspired sock patterns. • To fit foot/ankle circumference of 7.00-8.25(8.5-10.0) ins around.